Yogaji teaches a powerful and magical yoga. Their Hatha yoga is based on traditional teaching so it stays pure, strong, and original. It is rooted in Kundalini yoga and traditional Tantra while adapted to the modern life and needs. Certified by Yoga Alliance, Yogaji offers 200 hours yoga teacher diploma. Learn from experienced yoga master and walk this journey to become a yoga instructor with Yogaji! Yogaji offers a big shared or single bedroom, depending on the number of students. They have one bathroom, two toilets, and a kitchen. Yogaji studio, which is also your accommodation, is situated in the center of Vienna in the second district. There is very good traffic connection to the rest of the city or the green areas. Two famous huge parks, the Prater, and the Augarten are just in a walking distance. Eight minutes from the studio by foot, you can already rest at one of the urban side arms of the Danube River and in just 13 minutes away is the city center. During the course, we will encourage you to read the four classical texts of Hatha yoga, which we will provide as a gift and which are short and easy to go through. You will have days off and time to read. These texts are Gheranda Samhita, Yoga Upanishads, Hatha Yoga Pradipika, and the Yoga Sutras of Patanjali. At the end of the course, you will enjoy having a small written exam, that will test your knowledge about the teaching. You will have an early daily practice with other students while following the rhythm of Yogaji studio. Around brunch time, you will be allowed to have some rest before you continue with your class. Yogaji will give you a certification that will follow the standards of Yoga Alliance. Yogaji’s program can be viewed in the Yoga Alliance page under Durga-Ji Yoga. Yogaji follows the standard of Yoga Alliance and enriches it through their experience. 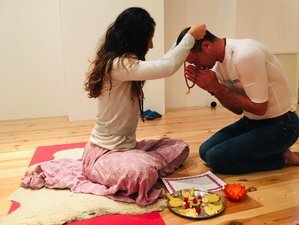 Their goal is to share unique gifts, that contains secrets which remain unspoken while giving you all the necessary knowledge as a yoga teacher. Yogaji always organizes one excursion in the town together with all their students. This will be determined when all students have gathered and shared their interest. Clemens Biedrawa practiced Meditation from a early age on. He received Trainings in Kundalini Yoga after Bhajan and Satyananda and a profound Hatha Yoga teaching after Vidjanand. He is deeply dedicated and is teaching is strong and uplifting. His teaching will enrich you with a deeper understanding of each yogic method. Julie is the founder of Durga-Ji, Hatha Yoga Center, and of the Kids Yoga French Federation. Julie is an experienced yoga teacher. She runs center and training since eight years ago. She devotes her life to yoga. After having followed the path of law, so to become a jurist, she finally chose the path of yoga to help people in perceiving consciousness. Her teaching combines true and traditional yoga with the interrogation of the modern society. She welcomes you with warmth, love, joy, and presence. Vienna is the capital of Austria with 1.8 million inhabitants and is the seat of many important UN departments. Vienna is one of the world's most beautiful historical cities. It is also known for being a metropolitan city with the highest life quality in the world. Vienna has the lowest crime rate, cheapest living, cleanest environment, and much more. Vienna has an amazing architecture, where most structures were built during the greatest expansion of the Austrian Hungarian Kingdom. It is an incredibly green and peaceful city. The city has parks, rivers, clubs, cafes, museums, and theater. Party and culture coexist without contradiction. There are so many tourist spots in Vienna, that it is honestly hardly possible to pick one. The most famous is, of course, the "Schloss Schönbrunn", which is the castle of the former emperor of Austria and Sisi. Vienna is trendy and vintage, with great design places and cool a exhibitions center called Museumquartier. It is a place to party, explore the best dances courses, swim, climb, tour around its museum, and most of all to meet different people from all over the world. During the retreat, Yogaji offers you tea and snacks. Vienna offers numerous cheap restaurant or eateries place to get nutritious and healthy food. Yogaji offers the joy to feed oneself to the students themselves. Yogaji studio in which you will sleep, rest, and practice is situated in the center of Vienna in the Second District. Many say it is the most charming area of the city. The city has old markets, amazing architecture, a river promenade and the Danube, large parks, woods as well as chick cafes and bars. You will find plenty of space to walk, sit and read, get some sky over your head, or just think about Yogaji teaching. Please book your flight to arrive at Vienna International Airport (VIE). From the airport, take the bus to Morzinplatz or by subway going out at Schwedenplatz U4, or Nestroyplatz U1, or Taborstrasse U2. Yogaji is happy to share yoga practices through Europe by teaching a deep traditional Hatha yoga that responds to people's modern needs.